A good everyday carry (EDC) knife will get you through everything from mundane tasks (making a cheese sandwich) to self-defense. The market for EDC knives is loaded with excellent choices, so it’s hard to choose one best knife. The best EDC knife for you is the one that has the features to get you through your everyday tasks, which are different for everyone. Someone who needs to cut rope every day will need a different knife than a person who cleans a lot of fish. Picking a knife is a personal choice. It’s also important to remember that your EDC knife isn’t going to be the best knife for every task. It’s meant to be good at a lot of things, but there will usually be a specialized knife out there that’s best to get a specific job done. That being said, nothing beats having a good knife that can do a lot of things. By understanding what to look for in a knife, you’ll be able to pick out the one that’s right for you. Here, we will review several of the best EDC knives on the market so that you can find the one that best fits your needs and budget. There is no such thing as the perfect pocket knife, so the key to choosing one is finding the knife with the features that are most important to you. For an everyday carry knife, you want a lightweight piece that won’t be cumbersome in day to day life. Most EDC knives are less than 5 ounces, but some can fall under 2 ounces also. Its dimensions are important too if you’re worried about the bulky appearance or how the knife appears to others. If you’re working in an environment with people who are uncomfortable around knives, it is a good idea to carry a more unassuming knife that doesn’t look “scary” to some people. This is smart for professionals such as plumbers or carpenters who work in client’s homes and might need to use an EDC knife while on the job. The blade lengths of EDC knives usually fall into the 2.5-3.8-inch range, depending on how long the overall knife is. Of course, the blade is the business end of the knife so manufacturers put a lot of stock into how well the blade performs. Most blades are made of steel. Steels also have different hardness and strength depending on what you’re looking for. There are steps you can take to care for your blade and help it resist corrosion and weather damage to prolong the life of your knife, most importantly keeping it clean. Knives are manufactured with a wide variety of blade shapes and edges, and each performs best in different situations. Keep in mind that for an EDC knife you want the type of blade that offers the most versatility. The other half of the knife is the handle. For folding knives, this not only functions as the part where you hold the knife, but also as blade storage. Handle material should be lightweight but sturdy, a tradeoff made possible by various synthetic materials used to manufacture knife handles. You can choose from molded nylon, fiberglass, titanium and aluminum handles among others. Some of the nylon and fiberglass handles are produced by heating the material and molding it in layers to the desired size and scaling for grip. The grip of the handle is important, too. Knives feature different scaling on the handle to provide grip, but you don’t want one with so much scaling that it will tear up your hand (or pants pocket) and make the knife a problem to use. The final consideration when shopping for an EDC knife is its design. Having a knife that fits comfortably in your hand will make any task much more enjoyable. That being said, the ergonomics of a given knife will be a little different for everyone depending on the size of your hand and what you’re going to be using the knife for primarily. A minimalist knife for precision work will feel different in your hand than a knife made for cutting heavier materials. The knife should react well to jobs that might be stressful on its overall design. Knives also differ in their opening and locking mechanisms; some include assisted opening while others rely more heavily on the manual side. All of this may seem a little overwhelming if you’re looking for your first knife, but we’ve put together a list of some EDC knives that have been tested as great lightweight, versatile knives from trustworthy companies. Here they are, in no particular order. Need an EDC knife but don’t want to bother with shopping on your own? Check out these top recommendations from us. With the weight of 4.2 ounces and 8.13 inches in length, the Columbia River Argus Knife is a larger option for an everyday carry knife. Its defining feature is the thumb disk that is used for the Outburst ® assisted opening mechanism. The thumb disk does need to be pushed up all the way for it to work, but the quick opening of the knife is good for self-defense situations when coupled with the knife’s relatively large size. The FireSafe® mechanism is designed to keep the Argus from opening in your pocket. Despite the spring-assisted design, it is easy to close, and the bead blast finish on the handle allows for a good grip. The Argus knife blade is manufactured with AUS 8 steel, which is a well-rounded steel that is made for good edge retention, corrosion resistance, hardness and durability. AUS 8 is used to make a versatile knife blade that can withstand all kinds of uses. A useful all-around knife for anyone who is looking for self-defense components in an EDC knife. We truly like the construction of this knife which is far better than any plastic handled knives. Moreover, it is the locking system that works well, you can open as and when needed just with one move. You don’t even have to worry about the knife getting opened on its own inside the pocket. Altogether, it’s a safe and smart choice available at a rather affordable cost. Related: The Columbia River Knife & Tool Cobia is one of the most often brought products with this knife. The outburst assisted opening is going to make sure, it opens on one shot. The overall length of the knife is 6.56 inches that comes with a stainless steel handle. Blade style of the knife is hollow grind, plain edge, and drop point that is something we all look for. At an affordable price, this knife is everything that you look for in an everyday knife. The handle of the 531 is a G-10, which is made of fiberglass cloth soaked in resin and baked in layers to form a lightweight handle. It’s molded into a herringbone pattern with dimples to improve grip. G-10 is known for its durability and light weight, and it doesn’t rust or soften over time. 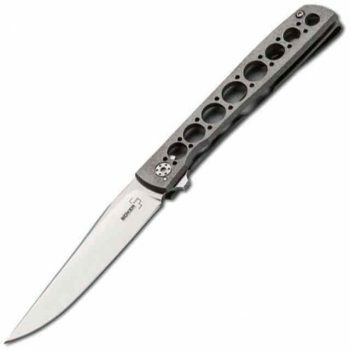 Benchmade is known for knives that open and close easily, and the 531 is no exception. In fact, it is a much improved version of the 530. 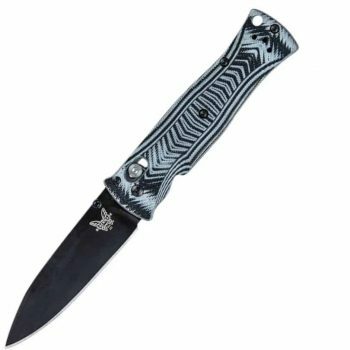 The knives of Benchmade are known for excellent customer service which is a must have thing when you are buying high-end knives. The company offers LifeSharp service, under which you can send them your knife and they will sharpen it and look over it for anything that needs tuning up. It’s a free service, and they’ll ship it back to you within 8-10 days. 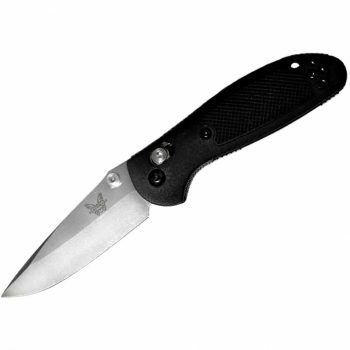 The Benchmade 531 Knife improves upon their older knife, the 530. The blade utilizes 154 CM steel, which is a high-end steel that isn’t too difficult to sharpen but still maintains good resistance against corrosion and has a 58-60 HRC hardness. While on the pricier side, this knife is a good choice for a lightweight EDC, plus you get the benefits of working with Benchmade’s customer service if you have any issues that need to be addressed. Mid-sized people claims this knife to be a perfect buy as its slim and can be carried out without any hassle. You should buy it for its decent edge and blades that can be sharpened easily. All over, it’s a great knife for the given price. Related: People who buy this knife also buy the Benchmade Mini Griptilian Knife. Slim and sleek, this knife works well for bag packer, hunters, hikers, and fishermen. The blades of this knife have the sharpest edge that you can imagine to have. Its textured handle scales are lightweight and strong enough to give a good grip. This thin knife is unassuming and a good carry for smaller jobs that don’t require a lot of force. The SOG SlimJim Folding Knife, as its name suggests, is a slim knife that is generally regarded as a simple and reliable knife. It comes in several sizes and arrives very sharp. The opposing high tension coil springs allow it to open once the mechanism has been engaged, and it has a safety to keep the blade in the handle so it doesn’t open when it’s in your pocket. The handle is made of bead blasted 420 stainless steel, which is highly resistant to corrosion as far as steel products go. The blade itself is made of AUS 8 stainless steel, which is a Japanese steel that is very easy to sharpen but doesn’t hold an edge as well as some other types of steel. It’s also not as resistant to rusting and corrosion as other steels. However, if you use this knife for smaller tasks that don’t require large amounts of force, it’s not as much of an issue. The bead blasted finish ensures that the users have a thorough grip on the handles. Even the tactile and cutouts helps in maintaining this feature, making sure it doesn’t slip out of your hand and you can have it handy whenever needed. The lock on the back makes the knife is quite difficult to use when cutting things as it needs the user to put a lot of force. For a moderate price, this is a good everyday knife for those who won’t be using it for intense jobs very often. 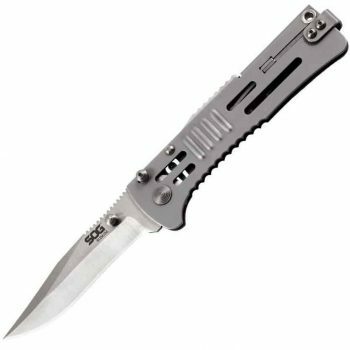 Related: The SOG Micron 2 Knife is one of the most often bought products with this knife. Those who like to have good knives, this one comes handy. 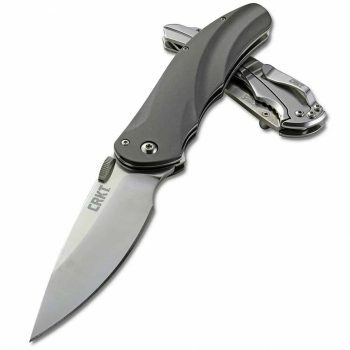 It is an incredibly small folding knife made from 420 stainless steel and bead blasted finish. You can hide it in your pocket like there is nothing in it, on the other hand the lock back provides safety when the knife is there in the open position. The Boker Plus Urban Trapper Knife is a sleek, very sharp knife that is great for carrying in a suit pocket or shorts pocket without being too showy. The titanium handle is very lightweight and has holes down the length of the handle to cut down on weight even more. This knife uses a ball bearing system on the hinged blade for smooth opening and features a thumb stud for one-handed cutting. The Japanese VG-10 steel is cutlery-grade and very easy to sharpen. VG-10 steel is also known for handling salt water environments well by having a high corrosion resistance. This thin knife is great for doing small, precise jobs as a top-notch minimalist pocket knife. The handle also features a titanium frame lock to help keep the blade in place. This is particularly important for smaller-scale, precise jobs where you really don’t want the blade to have much movement within the knife. The frame is very thin, giving you an entirely weightless knife experience. 1.7 oz the knife is 7 and ¾ inches with limited lifetime warranty. Those who are searching for a thin and light weight pocket knife, the Boker Plus urban Trapper is one great choice to make. You can buy it without any hesitation and for the price it comes, it’s not too much. Related: The VG-10 steel satin finished Boker Plus Kwaiken Flipper blade is one of the most often brought product with this knife. The Carbon Fiber handle makes it easy for you to hold the knife and you can bring it to use without it being slipped. 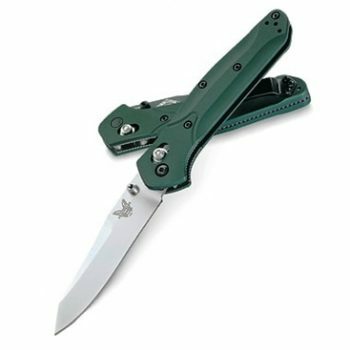 The Benchmade 940 Osborne Knife is a high quality, lightweight knife, but is very versatile and can put up with a wide variety of uses. While it’s small and lightweight, it is a sturdy knife that can get a lot of jobs done. The handle is made of aluminum and features an anodized titanium spacer which increases the oxidizing layer on metals to help it better resist rust and corrosion. The handle also has contours for grip and fits nicely in the hand. The AXIS® mechanism is highly regarded as a great-quality feature for opening the knife, but a brand new 940 might require some time for a break-in period of the AXIS before it will consistently open very smoothly. This knife features S30V steel for great edge retention and resistance to rust. This particular steel has a great balance of all the features you’d want in a knife blade steel. With the 940 being a Benchmade, you’ll have access to the great customer service previously mentioned like the LifeSharp service. This knife is more expensive, but it has excellent versatility and quality. The Precision of these knives is less than the width of a human hair, which is quite fascinating to have in your possession. We personally like this knife and it seems all sorts of worthy to have in your pocket. However, when it comes to price, this one lies on the higher side of the scale. So, if you are looking for a heavy duty knife and can bear the price, this is your perfect choice. Related: The Benchmade 943 Knife is one of the most often bought product with this knife. Clip point style blade elevates its performance surprisingly, giving you an almost weightless experience that is unbeatable. The knife holds excellent corrosion resistant qualities that make the knife efficient on long-term basis. Handles of the knife are made from black anodized materials that functions on a normal weight. The Spyderco Delica 4 Knife has been on the market since 1990, but Spyderco has been committed to continuously improving the product over the years. The feature that users like the most about this knife is its ergonomics and ease of use. The handle is made of fiberglass reinforced nylon which is molded to enhance grip while keeping the overall knife lightweight. The bi-directional texturing on the handles offers great traction, and this knife features a Spyderco signature: the “Spyderhole” or thumbhole for opening the knife. This hole is right in the blade and makes it easy to open without worrying about losing control of the knife. The VG-10 steel holds up in salt water with very low corrosion when compared with other types of stainless steel. Another useful feature of the blade is the crosshatching along its spine for improved grip for tasks that require pressing down on the blade. For a moderate price, this is a great knife. Because Spyderco is constantly updating the product, you’re getting the best version of a model that’s been around for almost 30 years. 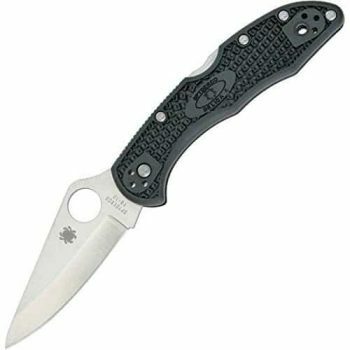 Related: The Spyderco Endura4 Knife is a great alternative knife that offers a comparable features to the Delica 4. It boasts a screw-together construction, 4-way clip, steel internal liners, bi-directional textured handle and more. The S30V steel used in the Spyderco ParaMilitary 2 Knife is made with vanadium carbides, which are harder than the usual chromium carbides. This steel makes a blade that maintains its edge well and is rust resistant. It has a G-10 handle with scaling to help the user avoid slipping on but still provide grip. This knife is easy to clean and its larger size and thick blade makes for a stable, trusty knife. Like the Spyderco Delica 4, this knife features the hole on the blade as the opening feature of the knife. While the dimensions of the ParaMilitary 2 are on the larger side of an EDC knife, it is still light for its size. That makes it a good choice for those who need a sturdy, stable knife, but don’t want to carry extra weight. 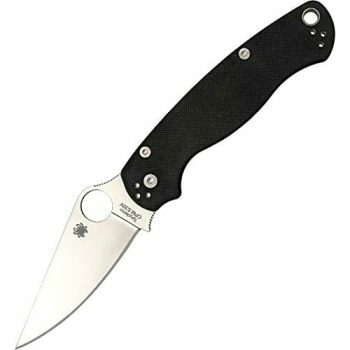 The unique design of the Spyderco knives is very distinctive of the brand. Because the knife has so much high-quality steel incorporated into its design for a relatively low price, it’s a good value for a knife. The lockup, steel, grip traction, sharpness, as well as the overall ergonomics is a total win win. We like the feel of it in our hands and even the grip is simply superb. For anyone who is fine with the comparatively bigger size of the knife, this one is the perfect pick at a decent price. Related: The Spyderco Military Knife is one of the most often bought products with this knife. For a gloved hand, there is a 14mm Spyderco Round Hole. Those who want to have a firm grip on the knife, then here is your best bait. Lighter, slimmer, and sharp blades, if these are the qualities you are looking for in a knife, look no further than Spyderco Military. Yet another Benchmade knife to make our list of great everyday carry knives, the Benchmade Mini Griptilian 556 Knife is a member of the popular Benchmade Griptilian line. The Mini Griptilian is an ounce lighter and about an inch shorter when fully open than its big brother the Griptilian. Despite its name, this knie is a formidable opponent to whatever you need to cut, and the price is inexpensive for a Benchmade. The Mini Griptilian has the popular AXIS® locking mechanism, which is useful for one-handed use and opens with thumb stud openers. The Valox handle is made of molded nylon and includes shallow grooves for a good grip. The 154CM steel blade is a high-end steel that’s made with molybdenum to improve edge retention while still maintaining a high level of corrosion resistance. While its small size makes it better for people with small hands, this knife is overall a very reliable and durable. It also comes in several colors and blade choices (serrated and flat edge included). Despite the knife is small in size, it can take in a lot of abuse and can stay in use for a long term. At a moderate price, this one comes with all the important features that you might look in a knife that comes handy. If you don’t have very big hands, you will love to have this knife in possession. Related: The Benchmade 551 Griptilian Knie with drop-point style blade is one of the products that people often buy with the 556 Mini Griptilian. The knife is injection molded, stainless steel liners, AXIS, screws, and coated reversible tip-clip. Because the knife comes with corrosion resistance properties, there is not going to be any chipping and you can use it in most of the daily work. It’s hard to go wrong with any of these high-quality EDC knives from trustworthy knife manufacturers. An EDC can really be beneficial to anyone because most people have situations where a knife is a much better option than using your teeth as a tool. While there are many top-notch knives on the market today, understanding the various knife components can help you find what you need for your daily life. That being said, the knives we covered here is just a sampling of the wide variety of EDC knives. So now let us know, what’s your favorite everyday carry knife? We definitely want to know what you think.